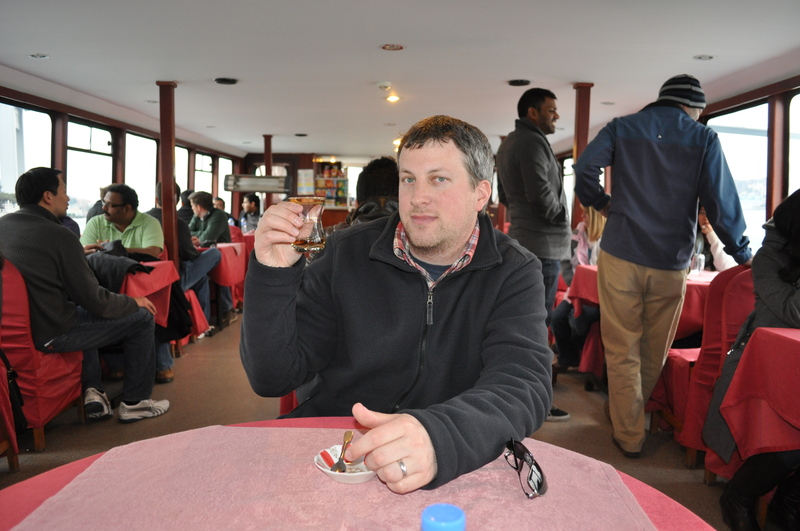 Today the whole group had a scheduled tour of Hagia Sofia, Topkapi Palace and a boat tour of the Bosphorus. We were scheduled to meet down at the lobby at 8:30am. I think we showed up about 8:35am. Lucky for us, we were not the last people to arrive in the lobby so we made the bus without too much of a fuss. 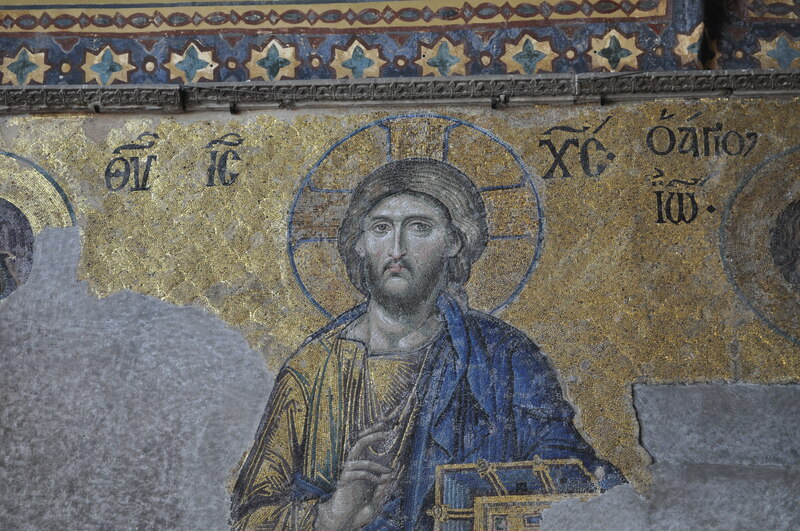 The bus left about 8:45am and we were off toward Hagia Sofia. 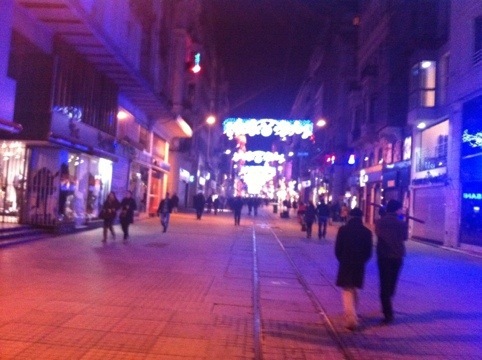 The bus took about 15-20 minutes to the get to our attraction from the Titanic City Hotel Taksim. Once there we were given our tickets and we had a tour guide that talked to us via audio device with headphones. 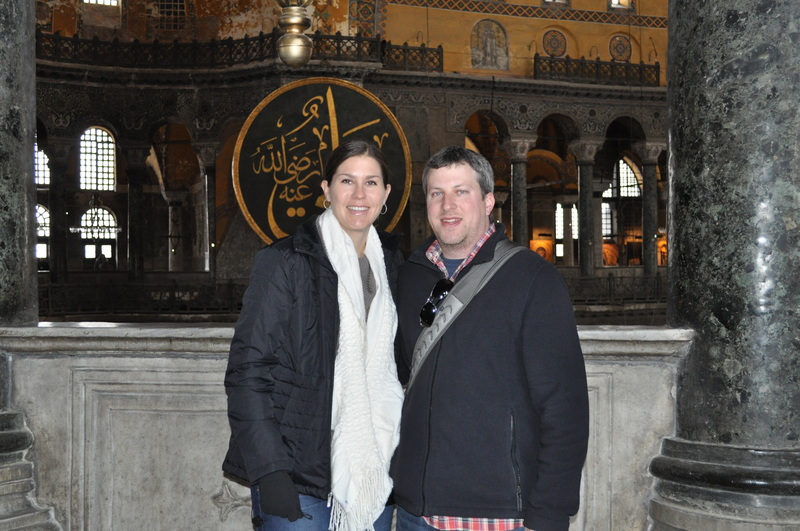 We toured the inside of the basilica turned mosque turned museum for about 2-3 hours. 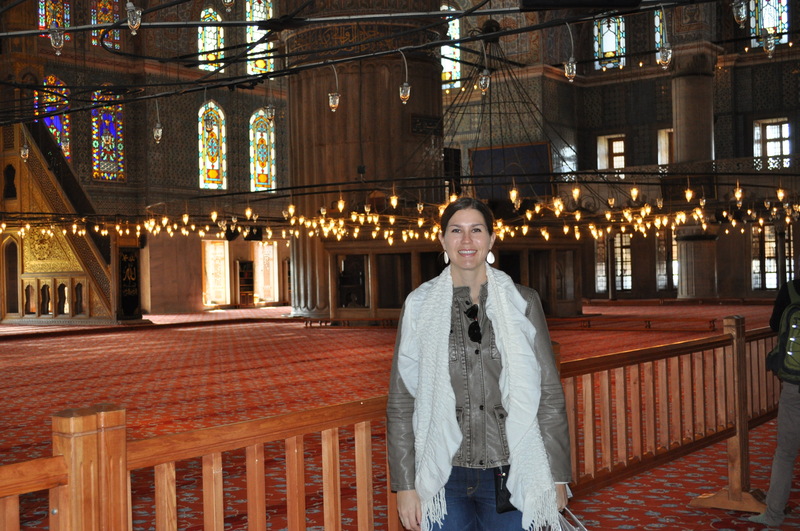 The inside of the church was mixed with christian mosaics and mosque inspired chandeliers. 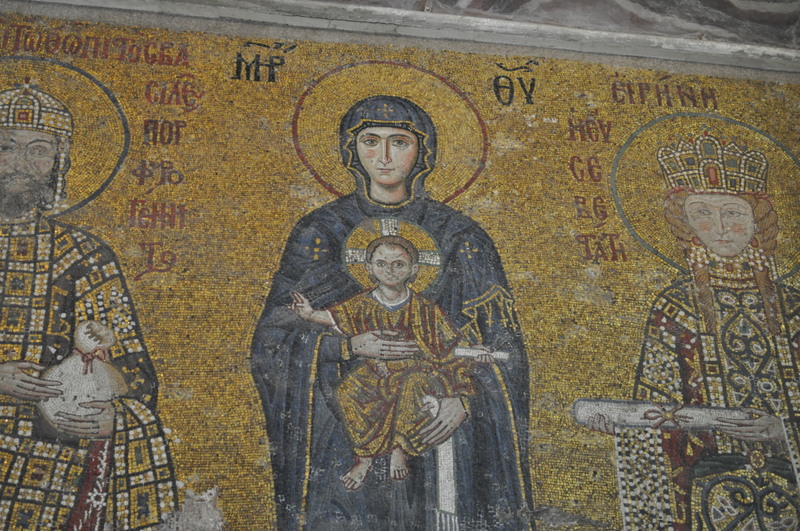 The mosaics were remarkable and adorned some walls and ceilings. It’s very massive on the inside from the bottom floor to the ceiling of the dome. Once we completed the inside we worked our way to the outside briefly and snapped a few shots of the grounds and the Blue Mosque that can be seen in the distance. 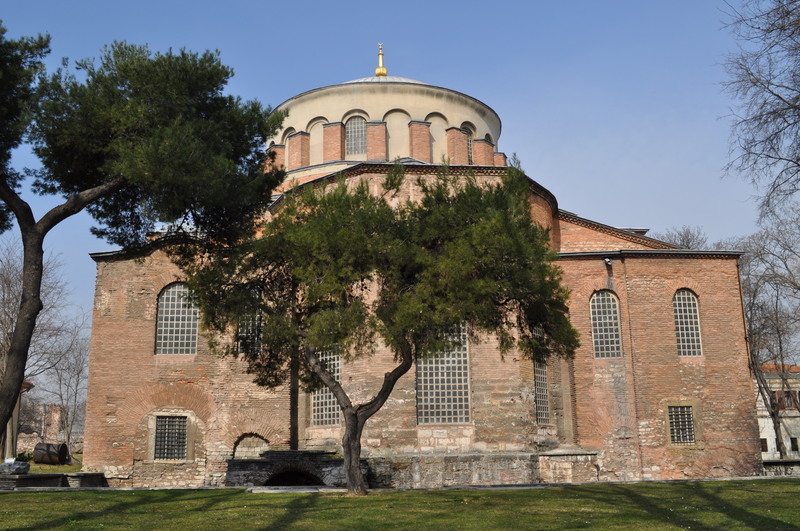 Next stop was Topkapi Palace which was a short walk from Hagia Sofia. 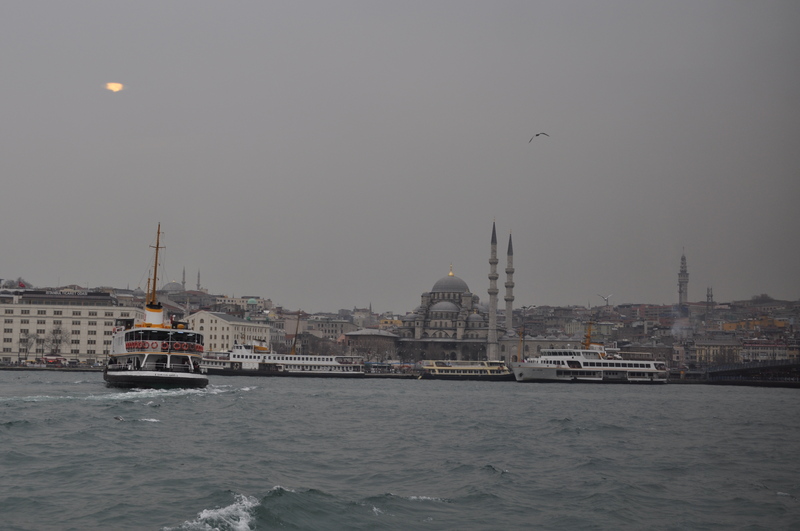 It was overcast in Istanbul today and a bit windy during midday. 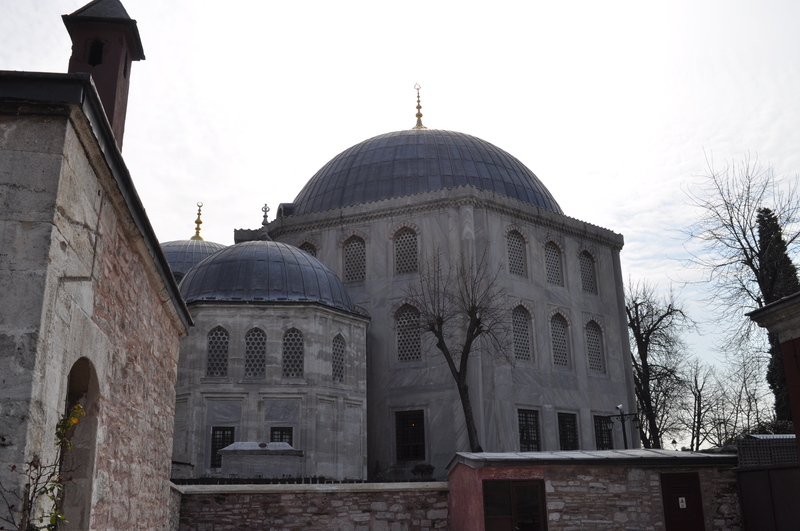 It was quite cold while inside the grounds of Topkapi Palace. Inside the grounds we stopped to get instructions on the plan for the group next to the Hagia Irene. 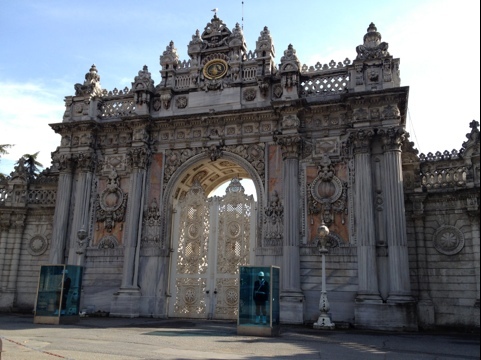 I snapped a few photos and tried to get a few shots of the gate entrance (The Gate Of Salutation) to Topkapi Palace. The first thing we checked out was the holy relics located in one wing of the courtyard. 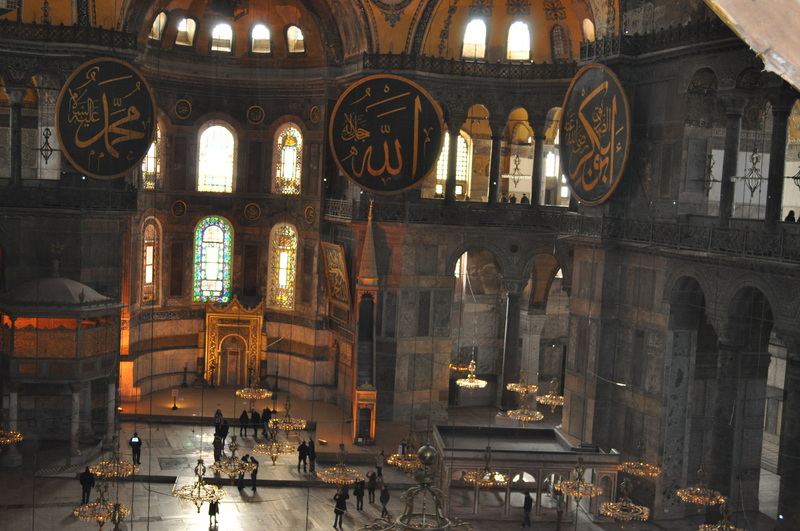 Inside were supposed relics from prophets such as David, Muhammed, and other religious articles. There was a “hand and forearm” of John I believe which was interesting along with the Staff Of Moses. 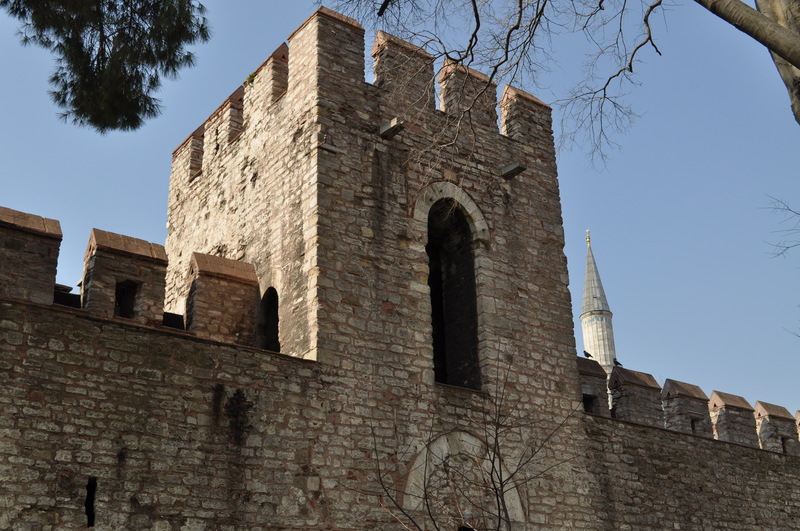 Topkapi Palace is filled with things to see including my favorite the Arms collection in one building. It had some fascinating weapons from the Ottoman period and dating back throughout the ages. It was quite remarkable and I highly recommend it. 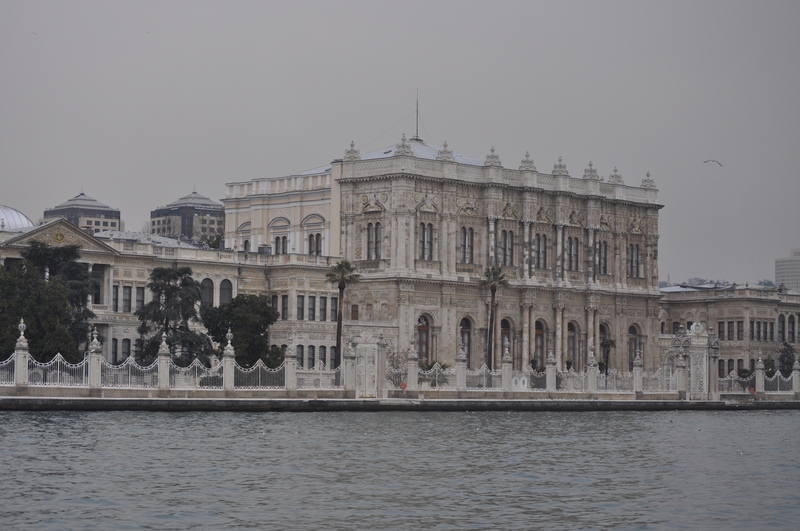 One building housed a collection of jewels, art, and wardrobes named the Imperial Treasury. A lot of people seemed to be focused on seeing this collection and it was kind of hard to get a good view while we were scurrying through. There was a royal sultan baby crib that I found interesting and some of the thrones for the sultans. One area Kat and I didn’t pay extra to see was the Harem. Some of the others toured this area and said it was great. 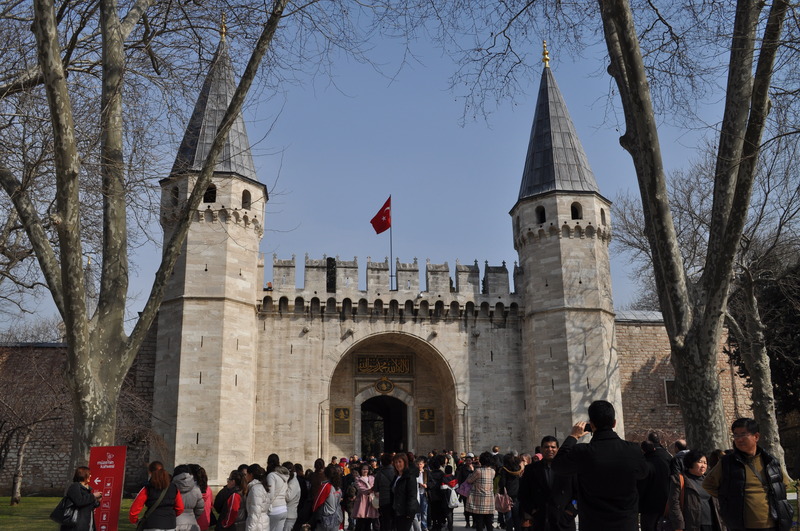 You really needed a long time to tour Topkapi Palace and the fact it was windy and cold lead to us skipping some areas of the palace due to walking all day and the weather. If I were to go back I would almost set aside a whole 4-5 hours to see everything. We were able to see some good views of the Bosphorus/Golden Horn from the grounds since its high up the hill from the waterways. While we were walking out, there was a group of kids that were hovered over one of Kat’s classmates and seemed to be fascinated with getting a picture with him. They tried to get a picture with us too but we were on the move! 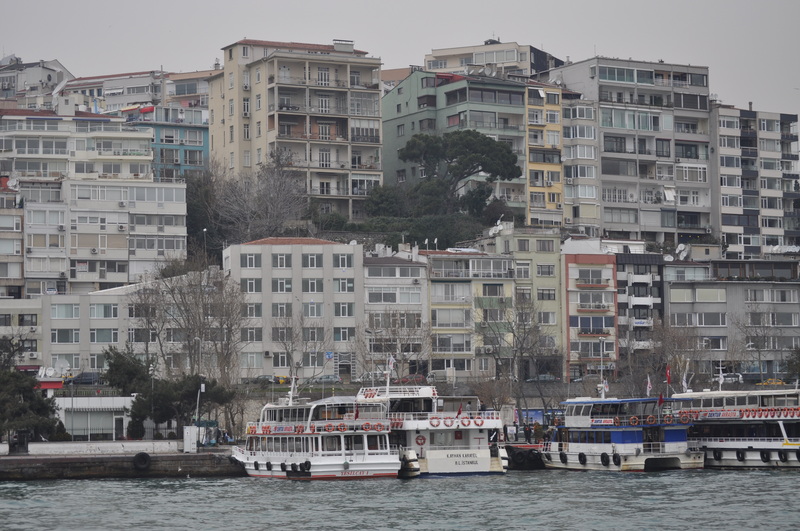 The final tour of the day included a boat tour of the Bosphorus Strait. Before we got down to the dock, my only thought was I hope this has an indoor area or we are going to freeze! Fortunately for us the boat did have a bottom deck area that was indoors with heat and plenty of windows to see out so we took a table down below. You could purchase snacks and beverages on the boat tour which was nice. Since we had been so cold we got some hot apple tea which is big in Turkey. I’ll have to say it is quite tasty. It’s like hot apple cider and it went down nicely. They bring it in a little cup and saucer which is nice. I took quite a number of photos of the shoreline and sites from the boat. I took a few inside and braved the decks outside for a bit to get some video and photos. 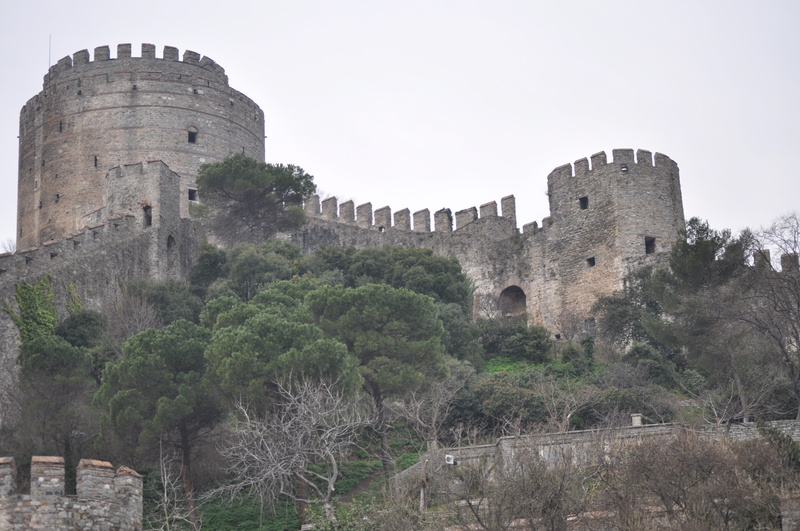 I was glad I was able to take photos of the Fortress Of Europe and Fortress of Asia from the decks while on the tour. I had read about the fortresses in the guide book and wasn’t sure if we would get to see them. A lot of the group was tired and some were falling asleep on the boat ride due to the nice comfy surroundings of the bottom deck (ie hot tea, heat). Kat and I stayed awake the whole time though I will say! Overall it was a good day with the whole MBA class and touring group. 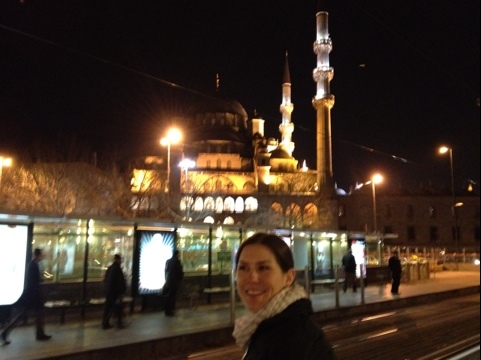 All 3 tours are must see stops if you are ever in Istanbul!!! Once back at the hotel, most of the group decided to take a rest and retreated to the hotel rooms. Everyone met up in the lobby for dinner plans to be hashed out and most of us decided to go to a spot on Istiklal where Kat’s Turkish classmate Alp had planned to have dinner with his father and a few friends. 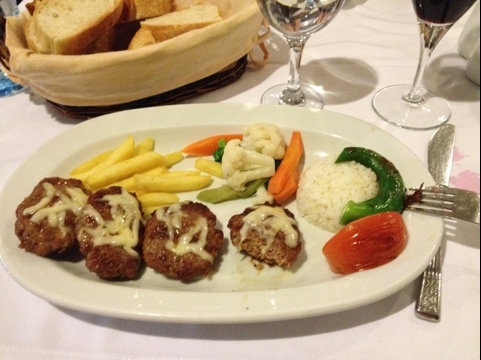 A group of about 20 of us met at this multiple story restaurant down off a side street of Istiklal. Alp’s dad ordered for the entire group and the waiters just kept bringing us food! Some things we found excellent and there were a few choices we were not brave enough to try I must say, that being the liver and onions. However, the fried sardines were excellent, along with this dessert made with bananas, honey, cinnamon, and a lite cream. It was ridiculously good! Our table ordered 2 extra dishes of the treat! Once dinner was complete we a big group went to another Nargile (hookah) bar and hung out late into the night. Sami and Alp played a fierce game of backgammon which is big in Turkey. I tried to learn the rules of the game as they played but it was pretty difficult to pick up on the fly. I may have to go learn how to play just in case I ever go back to Turkey or at least to give Sami another person to play the game with! We walked back in the cold to the hotel past 1am and Day 5 was in the books. Another long day, some great sites seen, and some good memories made. 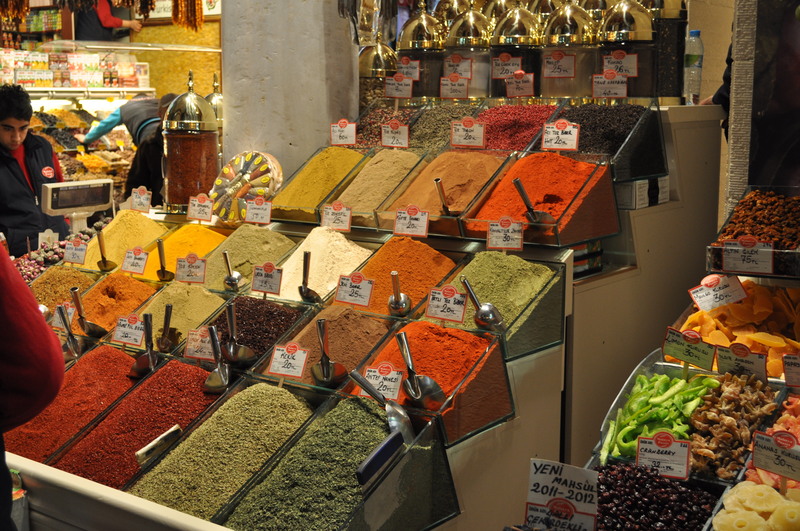 Once again today, the free time was in the morning so Kat and I decided to go to the Spice Bazaar. The store owners/workers stand outside their respective shops and try to get you in there shop by calling out to you and trying to strike up conversations with you. This can get a bit annoying I must admit. It seems ingrained in their culture to “sell, sell, sell”. The shops were typically quite small with spices hanging from the awnings or topped high in their bins. It was very colorful and interesting to see. 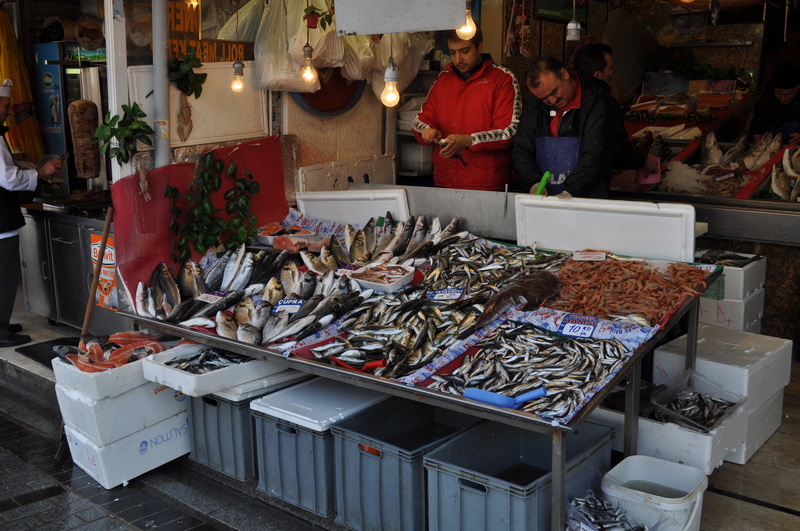 We walked around for about an hour and decided to go check out the fish sandwich boats across the street down on the Golden Horn. Our intention was to try the fresh fish out but we had reservations about the strong fish smell and decided we didn’t want to try it at this time. 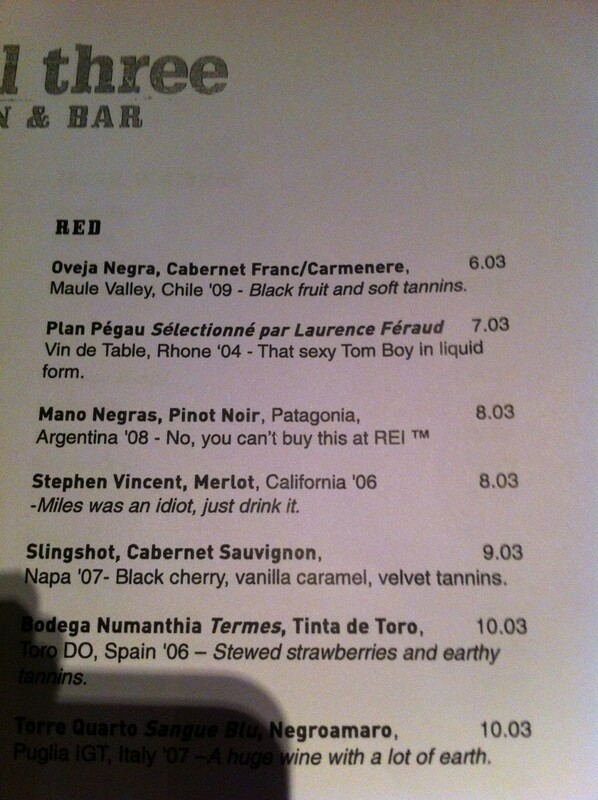 Looking back, I kind of wish we would have been more adventurous and gone for it. Some other people from our group told us they were really good. 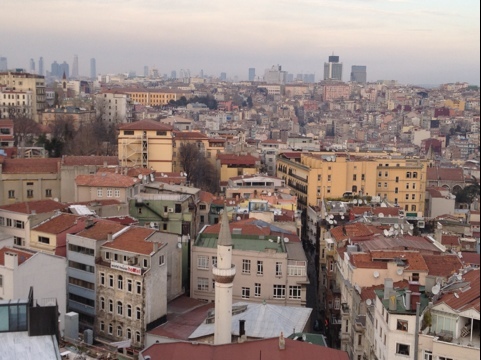 We took the metro from the Eminönü side of the Golden Horn to the Galata side. Once there we took the Tunel funicular which brings you up the hill near Istaklal Avenue. We hiked up Istaklal for 30 minutes back to the hotel so Kat could catch her afternoon lectures. 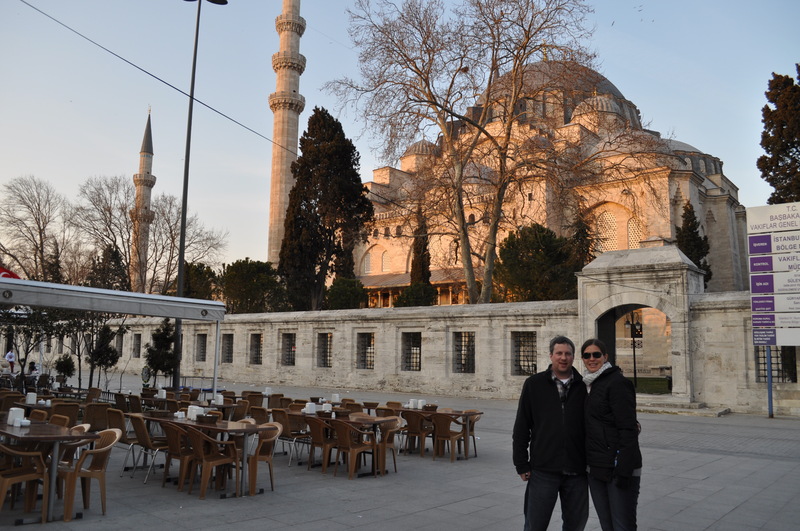 I convinced Kat and the Hochfeld’s (Jan and Lauren) that we needed to go see the Süleymaniye Mosque. We took a taxi to the mosque which took over 30 minutes due to traffic since it was around 4:45pm – 5:15pm. 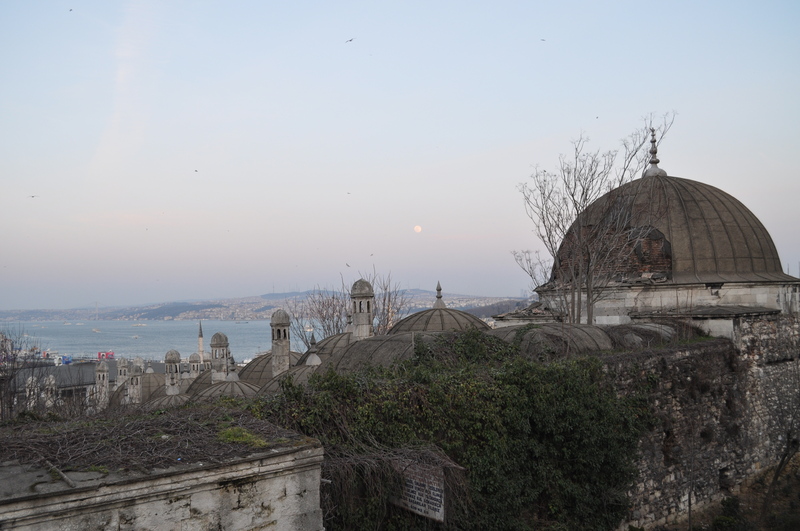 The taxi dropped us of about a 5 minute walk from the mosque so we hiked it over there down some small backstreets. Once outside the mosque we took a few photos and admired the courtyard area. It reminded me of Indiana Jones and the Temple of Doom for some reason due to the black birds flying around the minarets. 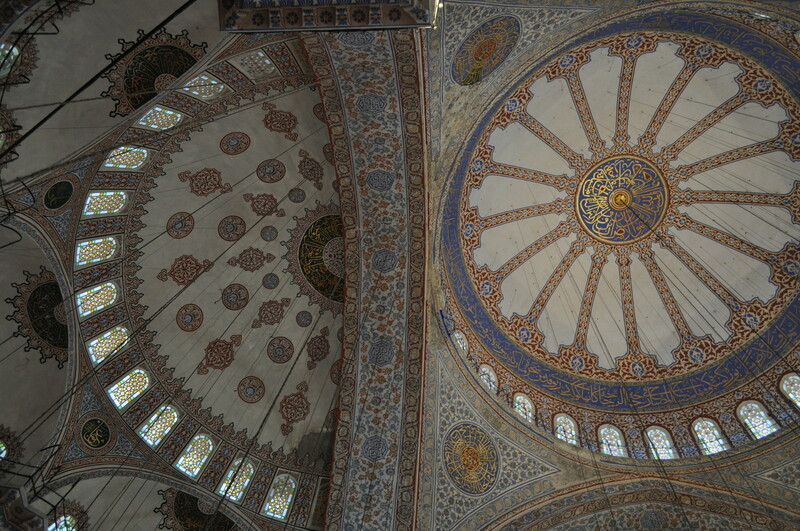 The tile work on the inside was just as impressive as the Blue Mosque from a few days before. The colors on the inside were red, black, and tan for the most part. 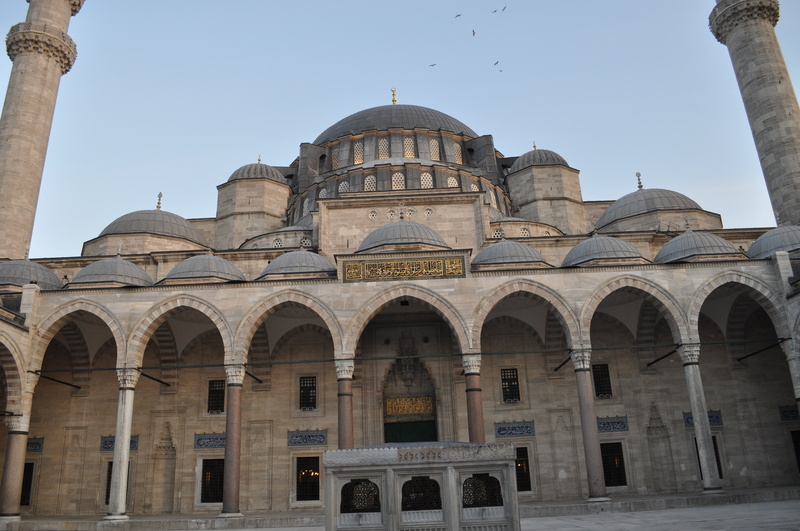 The Süleymaniye Mosque doesn’t have a nickname from what I could tell. 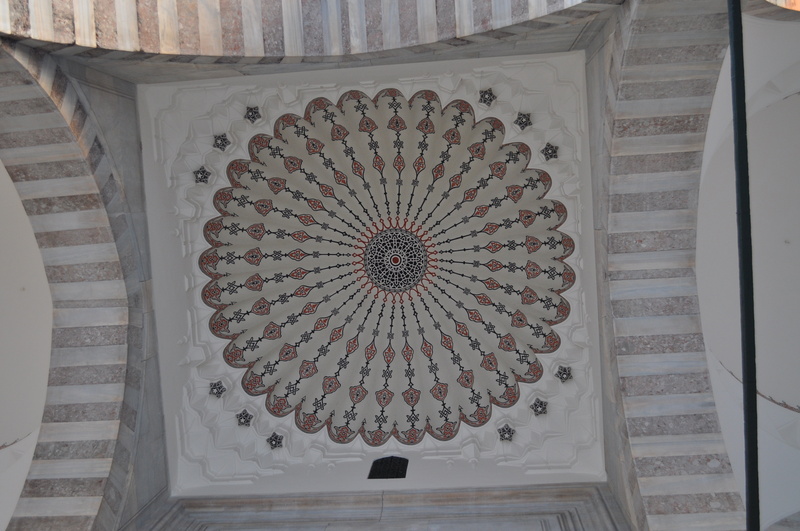 If someone asked me I would call it the Red Mosque due to color patterns inside, etc… seem to be a majority of red. 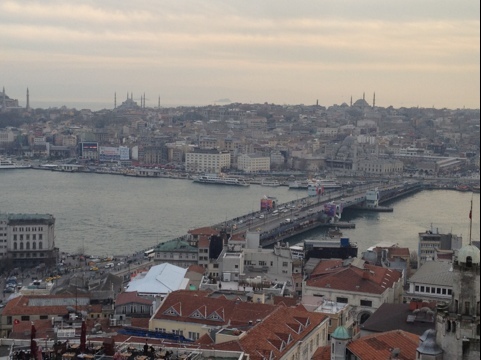 One of the books stated the views were scenic if you went to the outside looking back toward the Golden Horn/Bosphorus. 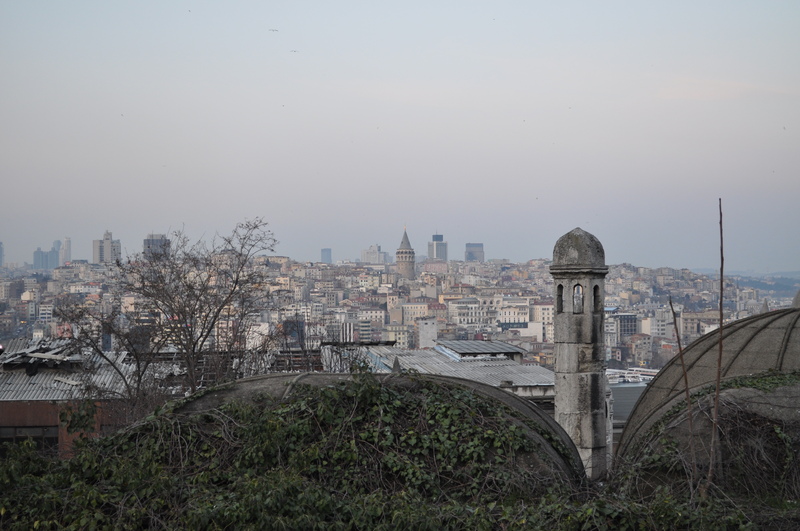 Sunset was drawing near and we were able to take some good shots from the outside courtyard area of the mosque looking back toward Galata Tower and the city. An interesting side note about Istanbul is in some public places you have to pay 1 TL (Turkish Lira) to use the public restroom. The bathrooms don’t always have toilets but are just holes also!!! I have a funny story on this matter but here is not the time or place! 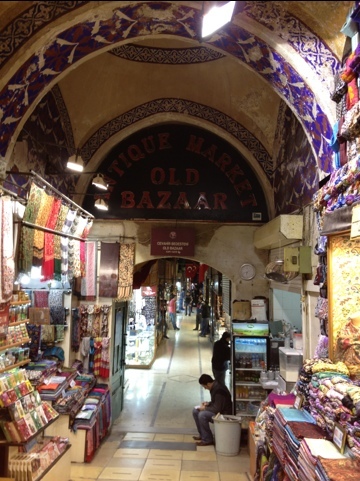 Our next stop was the Grand Bazaar which was about a 10 minute walk. Lauren had been before but the rest of us hadn’t. It was close to closing time in the bazaar so we were only able to walk around for 30 minutes or so. We were on a mission to find a silver shop Kat had read about in one of the books. Unfortunately once we found it, it was already closed for the day. 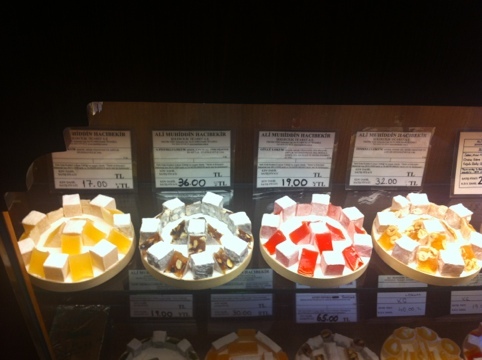 I was able to scoop up a couple of coasters I found interesting for 10 TL each while in the Bazaar. A group of us were planning to go out to dinner so we rushed back to the hotel around 7:30pm. 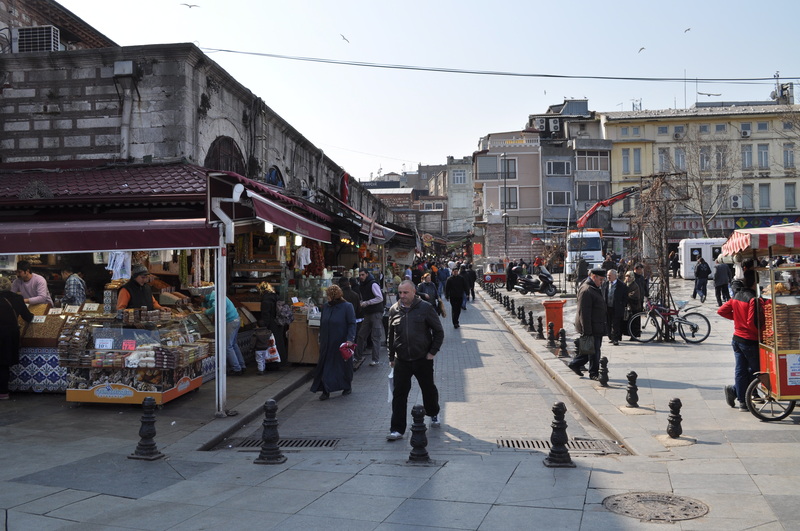 The Hochfeld’s, Nassar’s, Warneck’s, and ourselves decided to take taxis back over to the Ortaköy neighborhood to try and find a good place to eat. 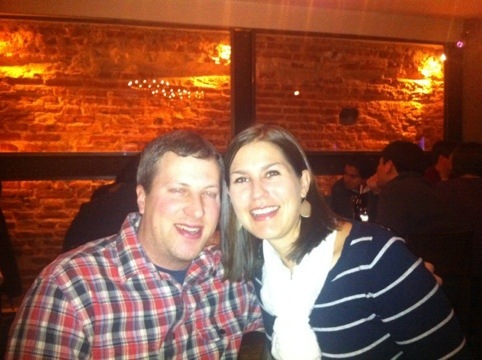 We ended up at a seafood restaurant down by the Bosphorus named Çinaralti I believe. The food was good and Raki was flowing for a few of the crew. 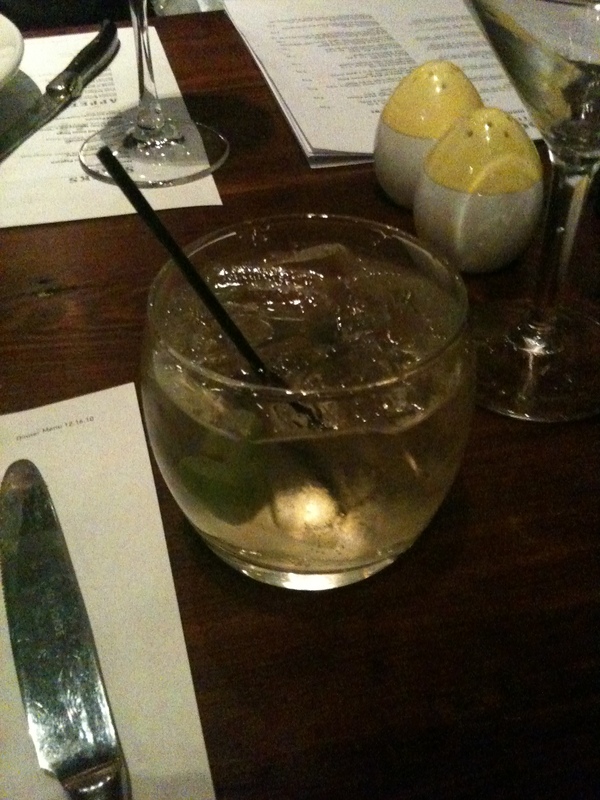 They put us near the back of the restaurant, I ‘m not sure if that was on purpose or not! We became the loud Americans by the end of the night I belive! A good time was had for sure. 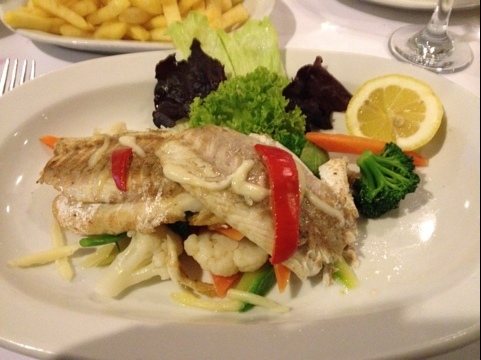 I had a tasty grilled fish dish. 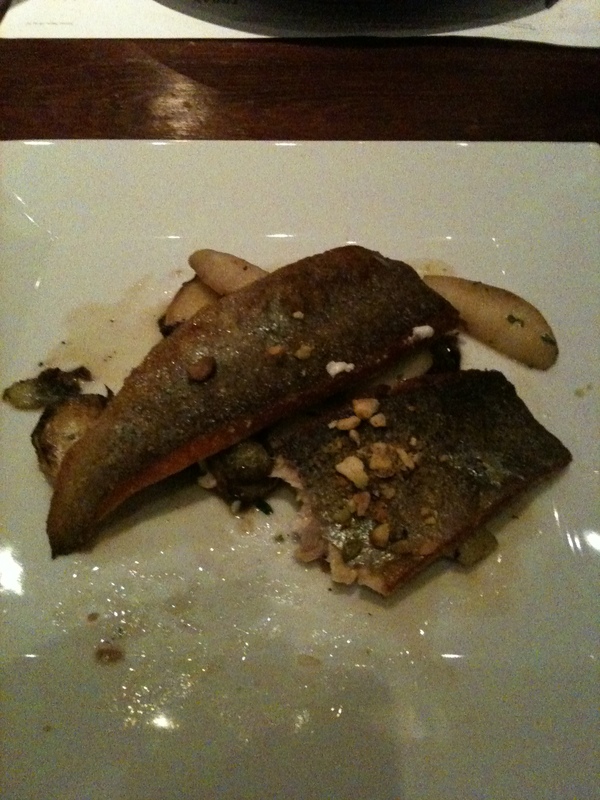 I can’t even remember what type of fish it was at this point but it was light. Kat tried the kafte and Jan had horse mackerel next to me. I got some good photos of the meals. 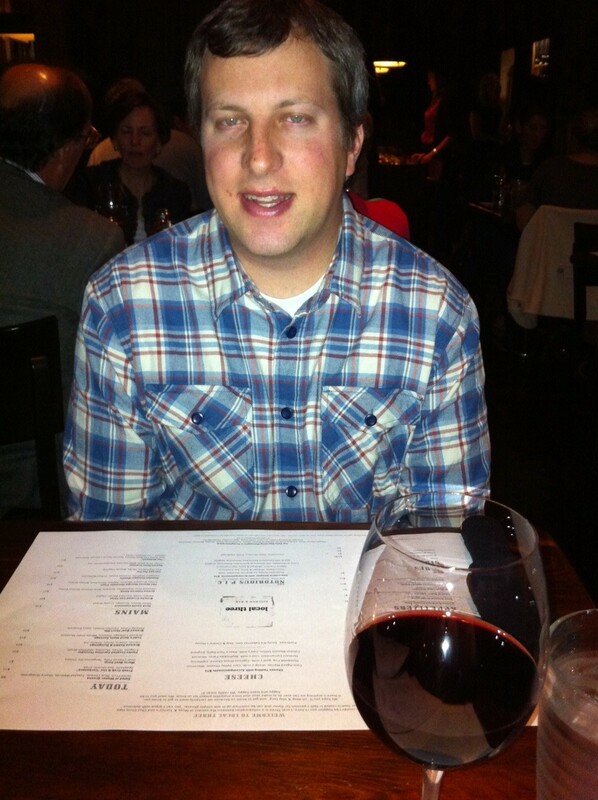 After a long dinner, we walked around the corner with a guy trying to get us to buy roses for the ladies. This guy was insistent and followed us for a good few blocks to where we could get a cab. I thought the guy was going to get in the cab with us until we bought the flowers. He eventually left without any of our money (poor guy). That about wraps up day 4. Pictures below! 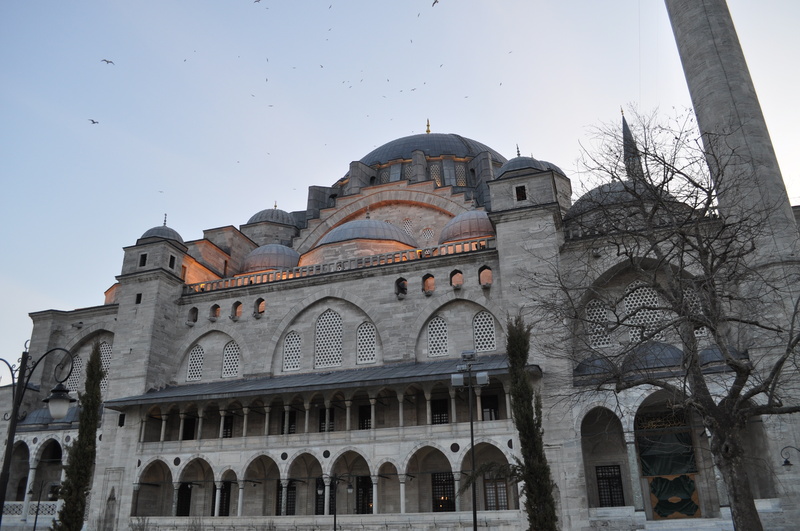 The free time for the MBA class was in the morning today so we got up pretty early and met a group of people to travel to the Sultanahmet area of Istanbul. 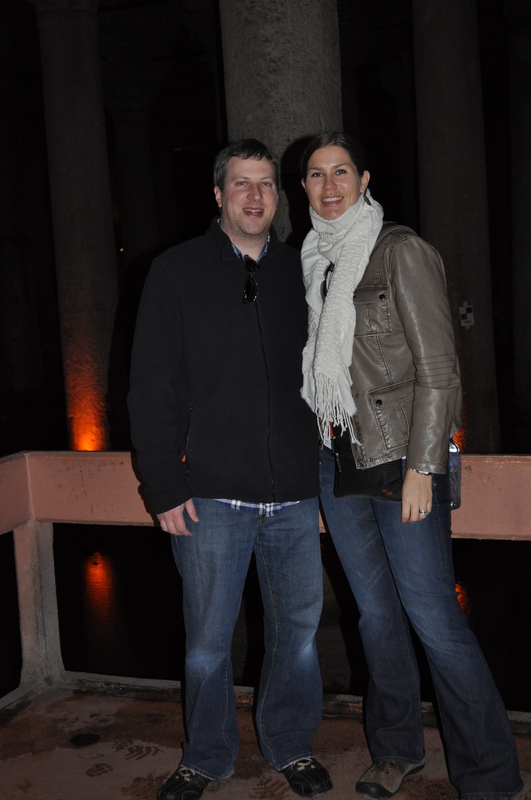 First stop was the Basilica Cistern. Kat was informing us that one of the Bond movies has a scene filmed here. It was dark with a haunting music playing?! As we moved along through the cistern we realized the music was coming from the “art piece” installed at the cistern floor (a lagoon monster)! It actually made sense to have this type of music in there I must say. 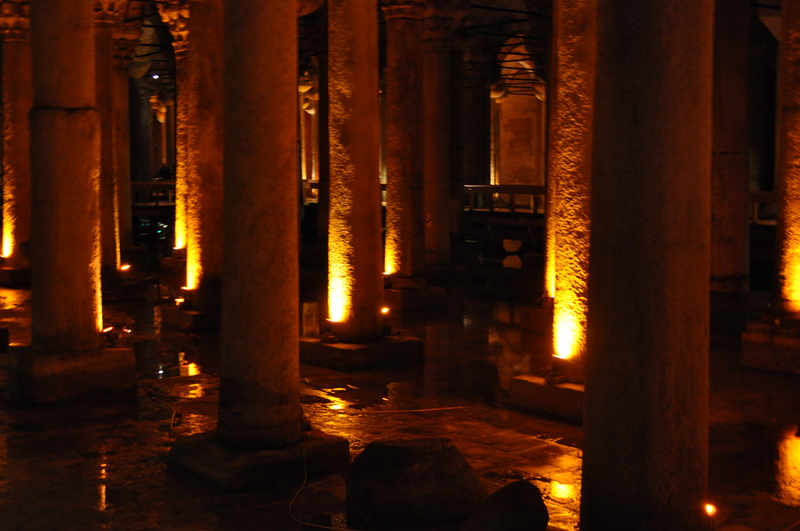 Once we left the cistern, the group had plans to go to the Spice Bazaar. 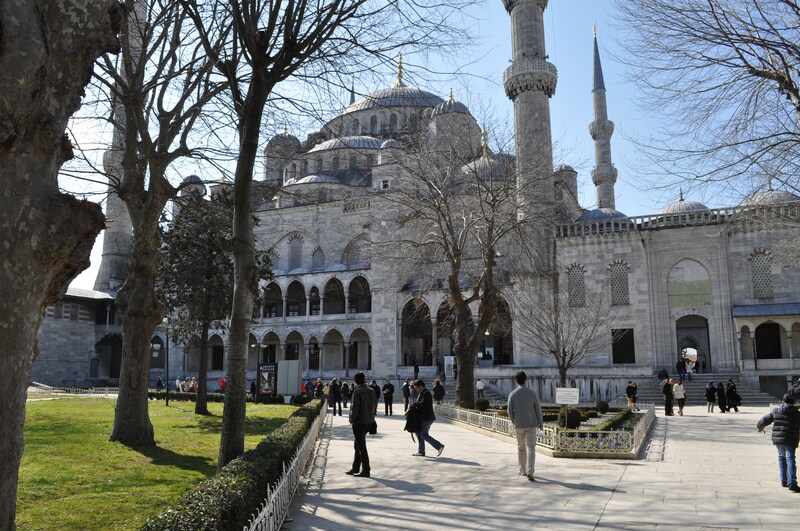 Kat however wanted to go see the Blue Mosque so we decided to part ways with the rest of the group and walk the short distance to the Blue Mosque, the nickname for the Sultan Ahmed Mosque. We were hassled a few times on the way in but Kat had read to ignore the people outside the mosque who are “trying to help give you a tour”. The mosque is free to visit for tourists but there is a donation stand at the visitor exit. The mosque on the outside is something to behold with all it’s minarets towering above the landscape. Once we found the visitor entrance, we found out quickly you have to remove your shoes and put them in a plastic bag. There were some women who were covering up there hair also as a requirement to go inside. However, it appeared some women were not abiding by this requirement and it didn’t appear to cause any issues while inside. Inside the mosque is very open and bare. The tile work on the walls and ceiling are amazing and distinct. The other thing that jumps out is the ceiling chandeliers that drop from the highest part of the ceiling (which is very high) to probably 15 ft above the floor. 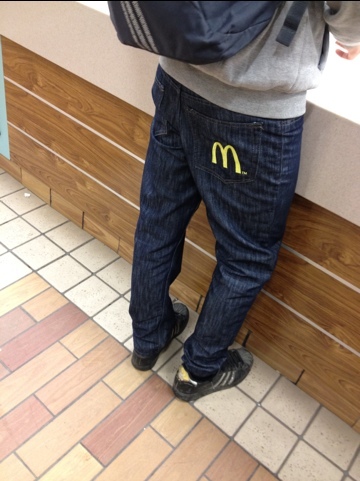 They seem really low but I’m sure they are really higher than you think. Since it was pretty cold while we were there, not having your shoes on can get cold quite quickly, so after about 10 minutes inside we left the mosque. 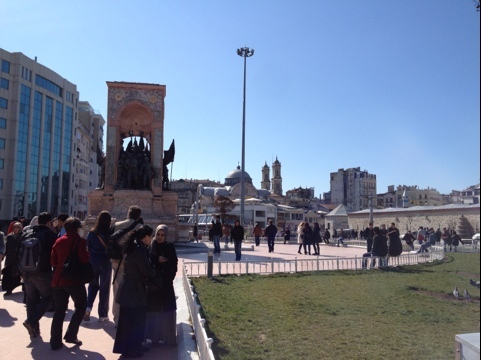 After leaving the mosque we walked to the sidewalk area outside the front of the mosque to visit the Hippodrome. This was where chariot races used to take place in the ancient world. 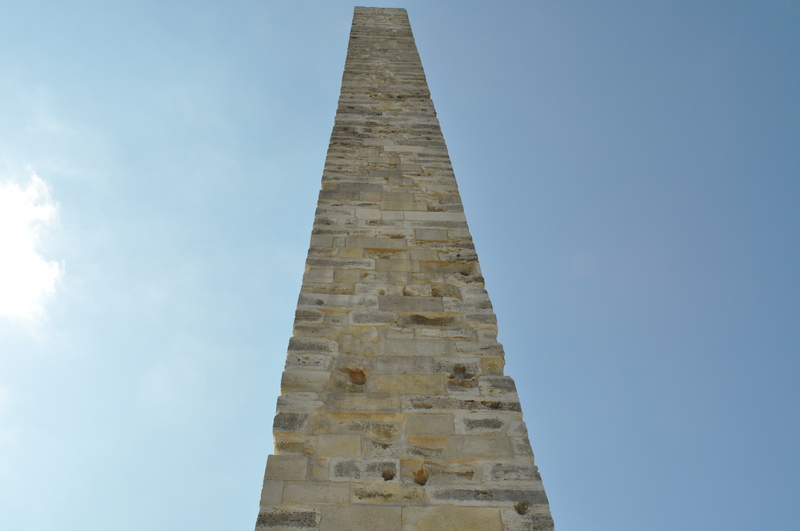 We checked out the only remnants left which are two obelisks and a serpent column. After a few quick photos we were on our way. Kat and I decided to take the Metro to try and get back to the hotel. After two stops, we thought we were about to go across the Golden Horn and reach the Galata area but we learned that not all of the trains go across the Golden Horn to the next stop. The train we were on had slid into the left track and stopped, then started going back toward the Sultanahamet area. We had a good laugh about that for a minute or two. Luckily, the train was moving pretty fast so we got off and got back on another train and probably only delayed us about 2 minutes. 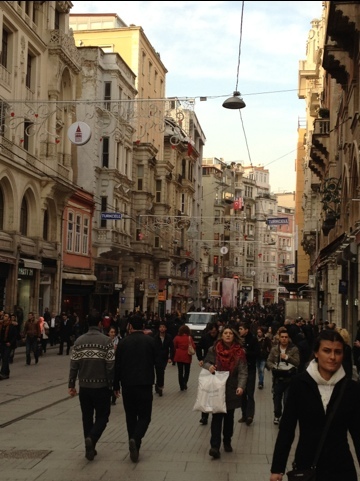 Once we got back near Istiklal Avenue, we hiked it all the way back up the avenue, through Taksim Square and back to our hotel. Our morning adventures over, Kat ran off to her lecture. Kat was gone from about 1:00pm – 6:00pm so I read about our travel books we had bought to get an idea on what else I wanted to see, etc… and took a nap. Since the plane ride, the late nights and walking around in the cold, I was catching a cold (lucky me!). 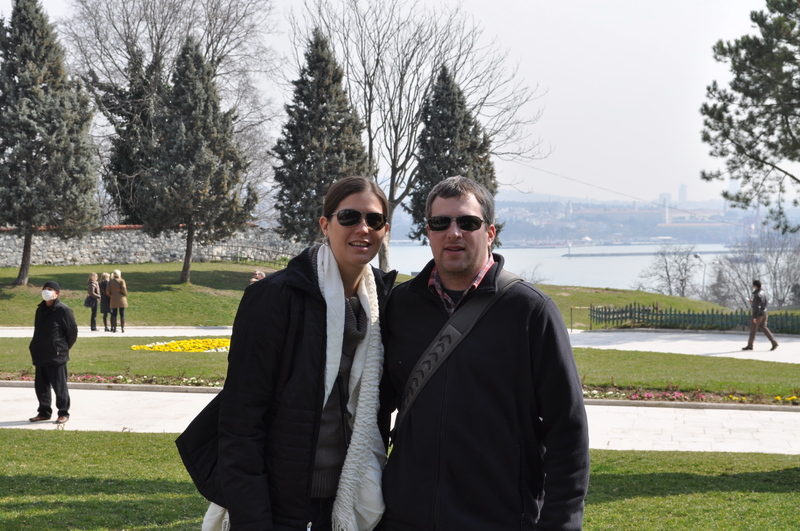 Most of the time we were in Istanbul it was pretty cold and windy (Highs in the 40’s/Low’s in the 30’s). 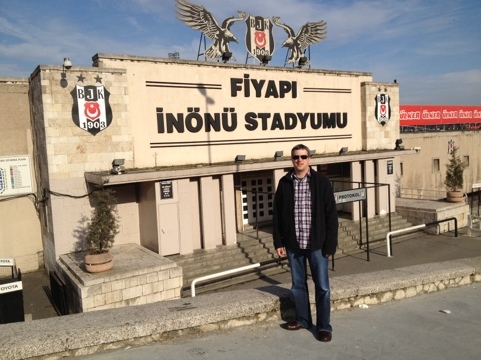 We arrived in Turkey at 9:35 in the morning. We got our luggage and took a taxi to our hotel. We were pretty tired but couldn’t get into our room until 2. We decided to walk around and take in some sights. 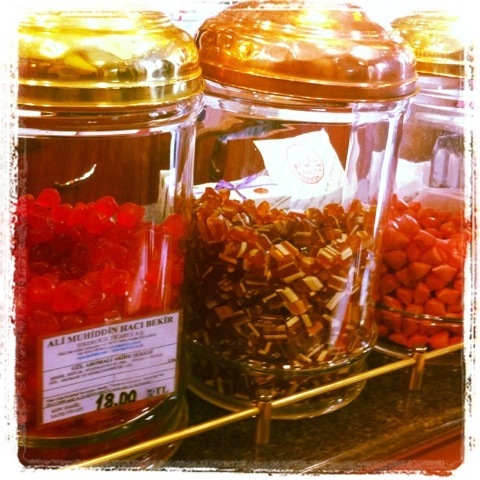 While out we ate some lunch and stopped in a candy shop. We then came back to our hotel, checked in and took a nap. We got up at 5:30 and got ready for dinner. We walked with about 20 people to the restaurant. We had our own room upstairs for dinner. 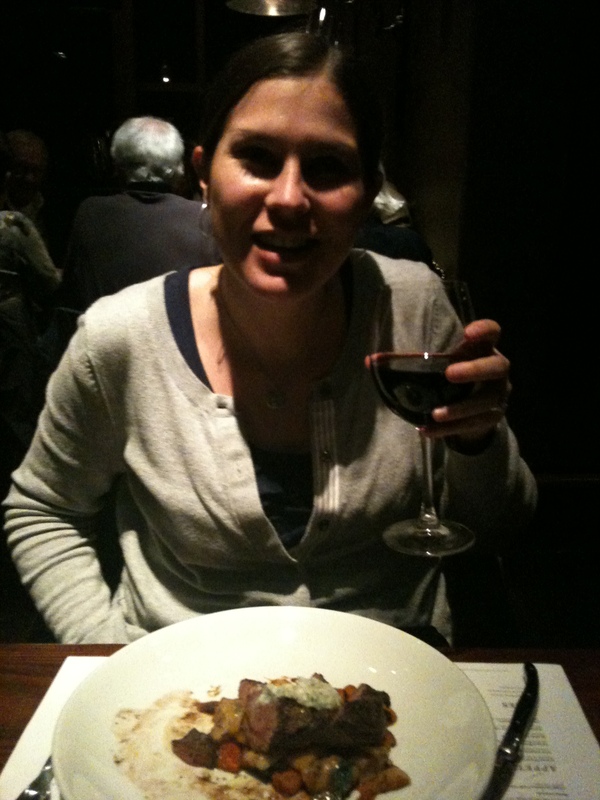 The menu was set so we ate and drank and enjoyed ourselves. After dinner we took over a small bar. It was pretty humorous, there was no one in the bar and then suddenly there were around 35 Americans in it. 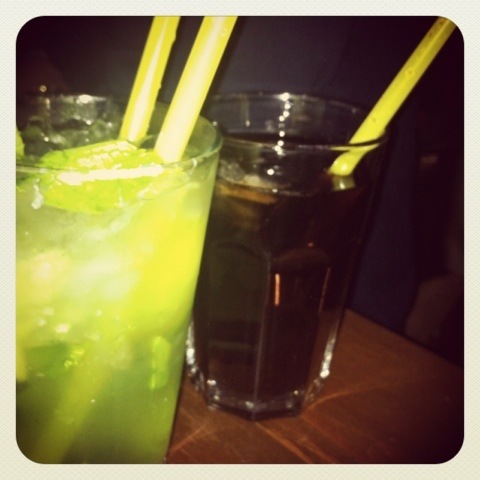 We had a great time. We walked back to the hotel and slept. A good day so far. B and I will be heading out on another adventure tomorrow. We hope to blog like we have done in the past. We are excited but not quite sure what to expect. 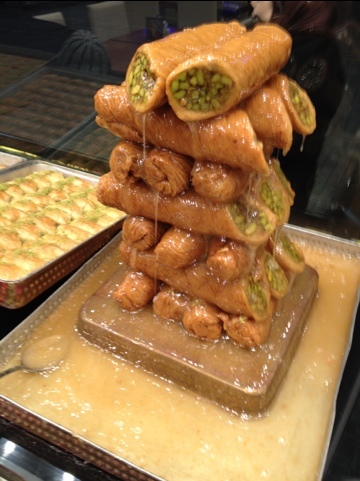 We are going to Istanbul for a week or so. We still need to pack up and we our leaving our little Jackson with B’s parents. We hope you will enjoy reading about our daily activities. We should be back on Sunday posting about our day.